35TH YEAR REUNION: 1st ROW, Brenda Emerson, Larisa Lemkins, Jeff Brown, Ed Movsessian, Vinnie Megna, Annette Prefontaine, Bob Perry, Nancy Neuman,Carol Pezold, Mary Packard, Beth Ross, Janet Hawkins, Nancy Atwood, Eric Christensen. 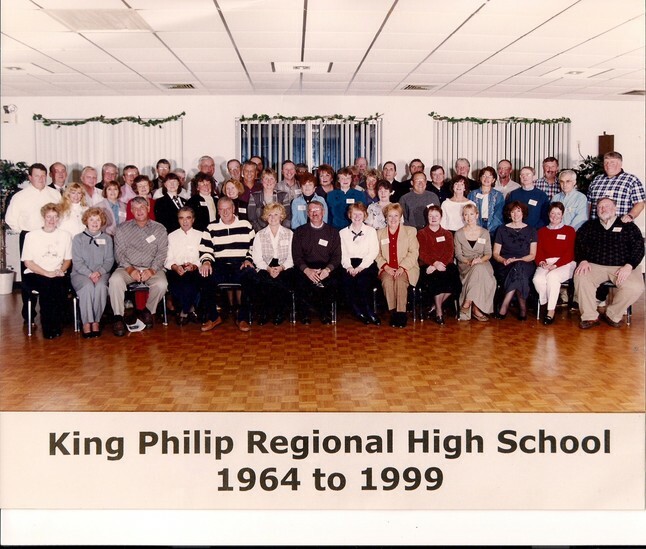 2nd ROW, Whiting Rice, Janice Henry, Susie Skinner, Joan Harmon, Jean Carver, Bonnie Keenan, Janith Stephens, Susan Wicklund, Marie Gowen, Mary O'Connell, Carol Tucker, Dave Patton, Shirlley Ames, Elaine Welik, Rich Knauber, Paul Gianetti, Ed Martisius. 3rd ROW, Bruce McAlpine, Bob Skinner, Erven "SAM" Samsel, Paul Lasky, Brian Walker who was with the class thru 8th grade and went on to graduate from Boston College High School, Bob Peloquin , George Tardiff, Artie Kempton, Chuck Carter, Lee Nightingale, Bernie Salles, Carol Frederiksen, Matt Sekula, Kathy (Kate) Nelson, the Velino brothers, William Hamilton,Mark Allen, Brad Smith, and George Gehman. Names provided by Rich Knauber.